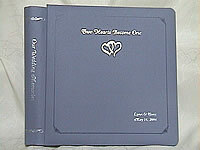 We specialize in scrapbook album imprinting (embossing, hot foil stamping or engraving). First impressions count! Why not make the outside of your photo albums as beautiful as the inside? Add personal touches on your albums with names,dates, graphic, special events etc. 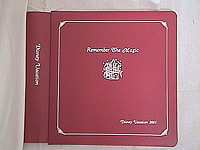 Imprints By Design offers imprinting on fronts, backs and spines of albums. We have a variety of fonts, graphics, and foils to choose from. If you're having trouble finding the right title for your album, we have hundreds of ideas to choose from. We specialize in scrapbook albums, however we can imprint on many other items such as: picture frames, mattes, paper, photos, binders, folders, napkins, leather and much more.